The stage is set with an inquisitive, wooly sheep gently tugging and baaing at her carer’s leash. She is shrewdly assessing the suitability of the incoming audience. 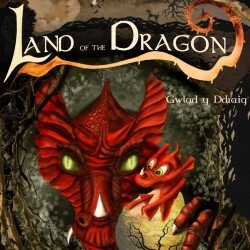 ‘Yes,’ she nods, ‘there are enough children to make the magic work – let our tale of Dragons and so much more begin.’ Boys and girls – and parents by arrangement – let PuppetSoup take you on a mystical, magical journey across storm-tossed seas, through enchanted forests to Gwlad y Ddraig – The Land of the Dragon. 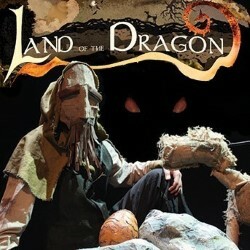 Drawing on the lyrical legends of the ancient Welsh oral tradition PuppetSoup bring life to fairy tales, ancient stories and The Mabinogion. See how a dragon’s egg passes through the hands of chosen bearers bound by Fate to protect it from the poisonous fangs of The White Serpent. Be in awe of the terrible beauty of the White Witch, Ceridwen, as she weaves her enticing magic. PuppetSoup create an animated tableau of shadow-puppetry, costumed actors and rod/string and hand manipulated puppets that replaces reality with wonder. Drawn in to a menagerie of fantastical creatures we are immersed totally in a fantasia of dance, mime and bilingual narrative. The antecedents for these theatrical styles are as ancient as they are global, drawing, in part on Japanese No Theatre and the rich cultural diversity of Brazil’s multi-cultural ancestry. We have been spell-promise bound by The White Witch not to give away any secrets or surprises. Let us just say that you had best keep an eye on your adult companions because Gelert, the ever faithful dog, is going to tug at everyone’s heart-strings stronger than he ever did on his master’s leash. The show’s climax comes when…. no, not telling! There’s an icy finger a’rapping at The Edinburgh Reporter’s door and the glow of a dragon’s breath through the key-hole. Better you go and find out for yourselves. You just might get a good luck lick and a woof from scruffy Gelert after the show (best stand back if he lifts his hind leg, mind!). A captivating morning set in a beautiful location. Take time to peer over the secret garden after you have had a meet and greet the beasts.